I tried. Honestly, I did. I snagged my Regia and proceeded to cast on 125 little tiny stitches using a provisional cast-on. And then I did it again because I wasn’t happy with the way my provisional cast-on turned out. Then I muttered and cursed because I wanted to get that second set of 125 provisionally-held stitches off the needle I was using and onto waste yarn…and then I decided I didn’t like what the Regia was doing and decided to switch to some nice variegated Cascade, and the thought of going through that hell again just made me call a stop to the whole crazy endeavour. That is why I cast on for a pair of very simple toe-up self-striping socks with toes and (afterthought) heels made out of black Kroy. I’m using some yarn that was tucked away in the stash: Schoppel-Wolle Sockenklecks Edition Tausendschön. I have no idea what that means, whatsoever. All I know is that it came already knit up as a scarf. I gather that the idea is that you wear and unravel the scarf while you knit it into socks. Myself, I unravelled it first, re-skeined it, washed it in SOAK, and dried it by hanging it off the shower bar in the main bathroom. It stayed skeined up for the past 6 months or so, and only last night made it into the nice puck you see there. It’s really really soft and nice to knit with. I’m very surprised that there aren’t more socks knit from this stuff. It’s pretty nice. Maybe folks preferred to have the scarf! Myself, I love me some stripey socks. I need even more stripey socks. Going to have to do something about that. The other thing on my needles right now, at least that I’m actively working on, is a scarf. I call it my “rescue scarf”. I recently changed departments at work, and had to go through the bin that all my stuff was stored in. I found things that were over 8 years old in that bin; thankfully nothing that could decompose. 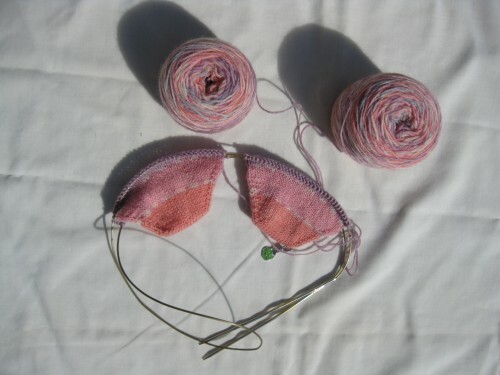 This was what I considered my “emergency knitting”, for those days when I forgot to bring my day-to-day knitting. Yes, it has happened that I’ve gotten to work and realized that I’d forgotten my knitting at home. I essentially rescued the scarf from the bin, brought it home and transferred it to straight needles for faster knitting. Yes, I said faster. I find scarves go faster on straight needles, at least when i don’t need to do a lot of silly things like lace or cables. At any rate, the yarn is Paton’s Shetland Chunky, which I think has a bit of Alpaca in it. For all I know, it’s 100% pure acrylic, but it feels really nice to knit with so I rather like it. The pattern is the ever-popular One Row Scarf by Stephanie Pearl-McPhee. Really easy scarf to knit with a very attractive finish. I like it as a gentleman’s scarf, as it seems to go well with everything from a ski jacket to a dress coat. Last week I mentioned the socks that I’m designing. I got a little farther along and have decided to take a little rest to decide where to go from here. You see, I love the texture, but it takes a little longer knit. I’m also a little worried about whether I will warp the fabric if I continue with the texture along the sole and start knitting plain stockinette above the toe cap. I’m thinking what I’m going to do is continue that texture up the foot til just below the ankle. We’ll see how it goes. In the meantime, it will marinate in my thoughts while I work on something a little less taxing on the brain. Plain ordinary stripey socks out of Trekking XXL in some very happily girlie colours. I’m just sorta ticking along, using the more salient directions for a Fleegle Heel. Normally I would just knit them one-at-a-time, but I’ve been on a two-at-a-time kick lately. I’ve been experimenting with Magic Loop vs. Two-Circ methods, and I will admit that I still prefer Magic Loop. 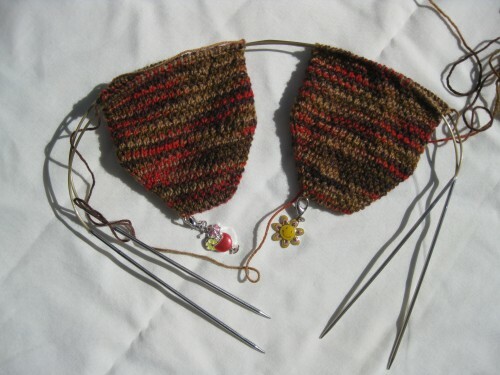 I’m thinking, though, that the two-circ method may work better with the Chiaogoo needles. Their cable is a little stiffer than the Addi Turbos, and as a result, the “bunny ears” of the trademark Magic Loop loops…don’t flop properly. I may have to pick up a couple of pairs of the slightly shorter bamboo needles to test this theory. 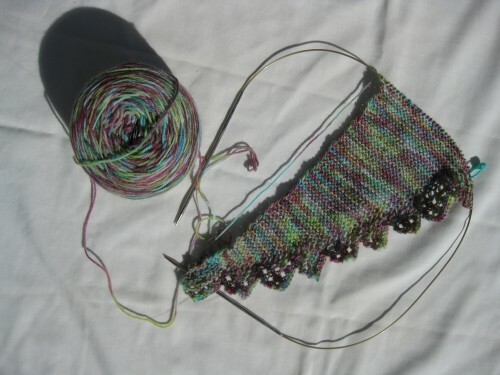 Finally, I managed to get a picture of the scarf that I cast on a couple of months ago and never finished. I’m thinking I may need to switch to straight needles, but again, it’s something I’m still pondering.